On Thursday 5th July, the Embassy of Switzerland in China hosted an event showcasing Sino-Swiss cooperation on mountain development: ‘Mountain Futures – a Shared Vision of Switzerland and China’. 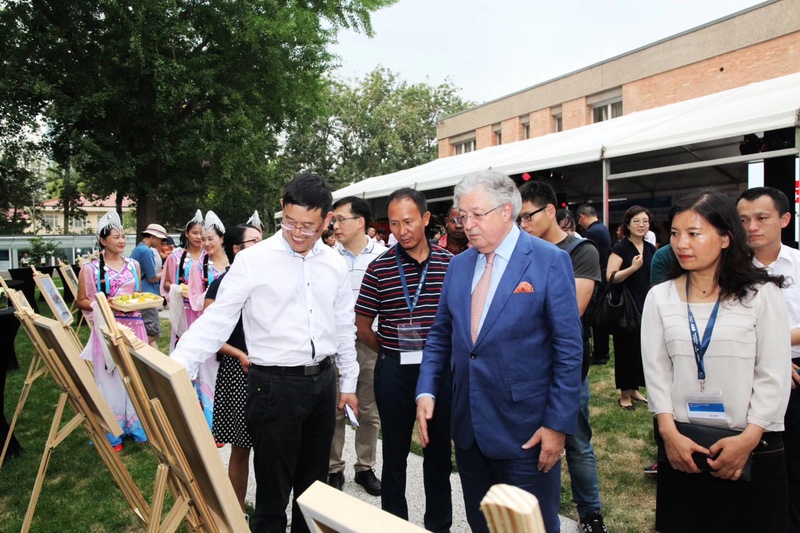 The Ambassador of Switzerland to the PRC, H. E. Jean-Jacques de Dardel, introduced an evening of events that presented some of the exciting new ways in which Switzerland and China are working together to pioneer new approaches to rural revitalization in mountain areas. The relationship between humans and nature has evolved through three ages and three spaces: In the age of nature, humans saw themselves as being part of the natural world; humans developed agriculture and lived in rural areas in close connection with the land. In the age of industry, or the Anthropocene, humans raised great cities, which relied on intensive agriculture in the lowlands and coastal regions. We are now moving into a new, uncertain age. It will be shaped by powerful new technologies such as artificial intelligence, but how these will affect the relationship between humans and nature has yet to be determined. We must look beyond the urban-rural divide to a third space for inspiration, one whose diversity and richness has been largely forgotten: the mountainscape. The event is taking place during Swiss Innovation Week 2018, and will feature videos, local ecological art, and an introduction to the Honghe Mountain Futures Innovation Centre by Professor XU Jianchu from Kunming Institute of Botany, Chinese Academy of Sciences (KIB/CAS). The Mountain Futures platform is a KIB-hosted initiative that works with international partners including Switzerland to create and share innovative solutions that secure a sustainable future for mountains and their people. The event also promoted a new book, ‘Mountain Futures: Inspiration and Innovation from the World’s Highlands’ which illustrates inspiring stories from mountain region around the globe with stunning color photography. Attendees have the opportunity to discuss new advances in smart agriculture for rural revitalization, and taste high-value mountain products such as Swiss cheese and mangoes from Honghe, Yunnan. Mountains are home to more than 900 million people, of whom 70 percent still live in rural areas, they also provide ecosystem goods and services to about half of the global population. Mountain regions are increasingly affected by various drivers of change such as migration, climate change, changes in local and international policies, increasing accessibility and commodification. The Mountain Futures platform for international collaboration on mountain issues is led by KIB/CAS, Beijing Institute of Animal Husbandry and Veterinary Medicine, Chinese Academy of Agricultural Sciences, the World Agroforestry Centre (ICRAF), and the Honghe County People's Government.